Rent Royal Sonesta Hotel | Corporate Events | Wedding Locations, Event Spaces and Party Venues. Located on the Cambridge side of the Charles River, the newly renovated Royal Sonesta Boston is a AAA approved Four Diamond upscale hotel offering guests spectacular city views, luxury accommodations, regional cuisine, and contemporary art. Equipped with the latest technology, the rooms are designed with comfort and convenience in mind. The hotel’s conference services and culinary teams work together to create unique and successful events—from the overall theme to minor details. We have provided detailed information about our meeting planning services and how we can work with you to create the perfect meeting for any group, large or small. A popular destination for extraordinary city wedding venues, Royal Sonesta Boston offers an ideal combination of old world charm and modern elegance, and was recently named WeddingWire's Couples' Choice Award for 2016! With sweeping views of the Charles River, beautifully appointed gathering spaces accommodating up to 550 guests and a dedicated catering staff to plan every detail–Royal Sonesta Boston weddings are affairs to remember. 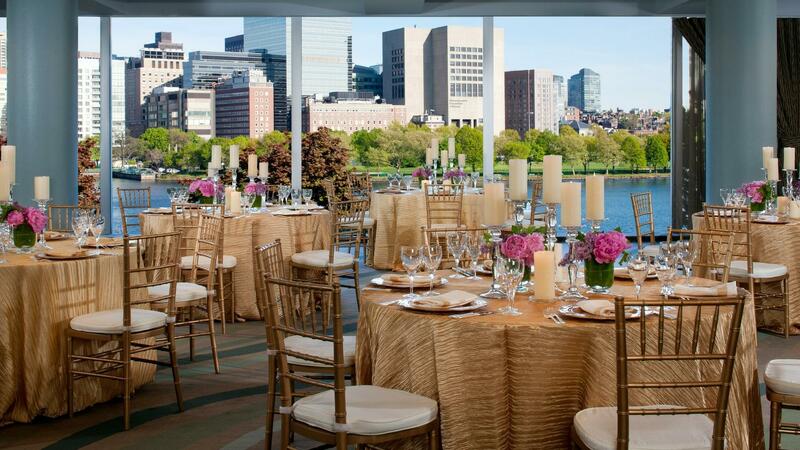 Royal Sonesta Boston boasts premium outdoor, riverfront space with our Riverside Terrace. The perfect backdrop for a waterfront wedding or celebration, intimate al fresco gatherings, or social events with the city skyline in full view.